Description: The legendary Swedish figure Disa fulfilling the dictates of a riddle in order to go and see King Freyr. Freyr had said that she could visit him if she came to him "not on foot nor on horseback, not driving nor sailing, not clad nor unclad, not in a year nor a month, not by day nor by night, not in the moon's increase nor wane" (Thorpe "Northern Mythology 155). This copy of Atland Eller Manheim... Olaus Rudbecks Atlantica was purchased by P.A. Baer from AbeBooks. P.A. Baer photographed this illustration from her copy of Atland Eller Manheim... Olaus Rudbecks Atlantica. Illustrations from the 1939 edition of Atland Eller Manheim... Olaus Rudbecks Atlantica are in the public domain. Rudbeck, Olaus. Atland Eller Manheim Dedan Japhetz Afkomme ... =: Atlantica Sive Mannheim Vera Japheti Posterorum Sedes. Upsalae, 1675. Print. Rudbeck, Olaus. Atland Eller Manheim... Olaus Rudbecks Atlantica: Svenska Originalteksten. På Uppdrag Av Lärdomshistoriska Samfundet, Utg. Av Axel Nelson. Uppsala: Stockholm, Almqvist och Wiksell, 1939. Print. Thorpe, Benjamin. Northern Mythology: Comprising the Principal Popular Traditions and Superstitions of Scandinavia, North Germany, and the Netherlands. London: E. Lumley, 1851. Print. P. A. Baer notes that this illustration appears to be related to the illustration of Thor Riding a Goat in La Mythologie, Racontée Aux Enfants in Jules Raymond Lamé-Fleury's retelling of the myth involving the laming of Thor's goat (385). See: Myth-Racont-Enfant-1891-385-01.xml. Olaus tried to prove that Sweden was the lost Atlantis, the cradle of civilization, and that Swedish was the the language from which Hebrew and Latin had evolved. 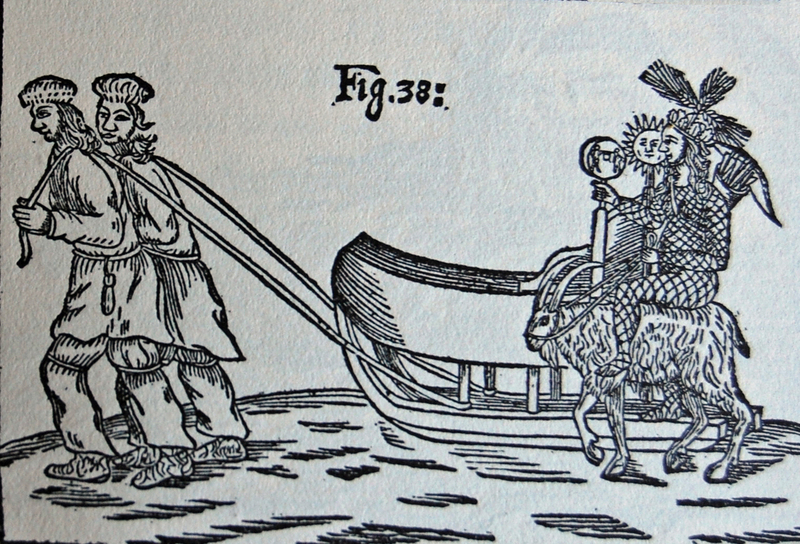 Disa was the daughter of a Swedish chieftain in a Swedish Saga, which is preserved in Historia de Gentibus Septentrionalibus published by Olaus Magnus in 1554. Atland Eller Manheim... Olaus Rudbecks Atlantica: Svenska Originalteksten. Olaus tried to prove that Sweden was the lost Atlantis, the cradle of civilization, and that Swedish was the language from which Hebrew and Latin had evolved.